Product prices and availability are accurate as of 2019-04-21 10:09:34 UTC and are subject to change. Any price and availability information displayed on http://www.amazon.com/ at the time of purchase will apply to the purchase of this product. 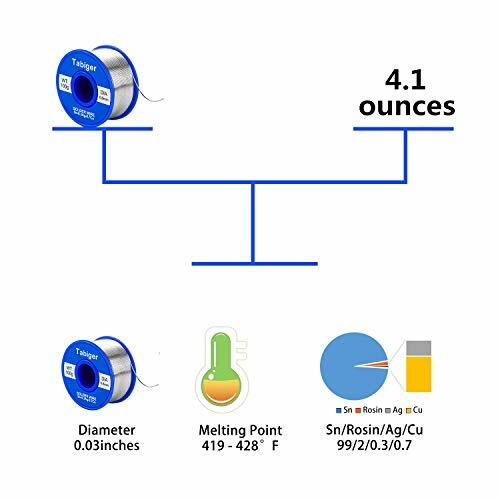 Solder wire is a important part of electric soldering. When you are soldering something, it can be used to add to the surface and gap of the electronic device with the metal as a filler, and the fixed electronic device becomes the main component of the solder. improved the soldering efficiency, the residue is very small too. 1.Tabiger Direct Customer Sevice Team is dedicated to offer our valued customers a great and professional services - Timely email reply, Helpful solutions, Refund & Return Warranty. 2.We supply 45 days money-back & 12-month warranty. Any questions you have, please don't hesitate to contact us. We will get you back within 24hours. ?Lead Free Solder ? 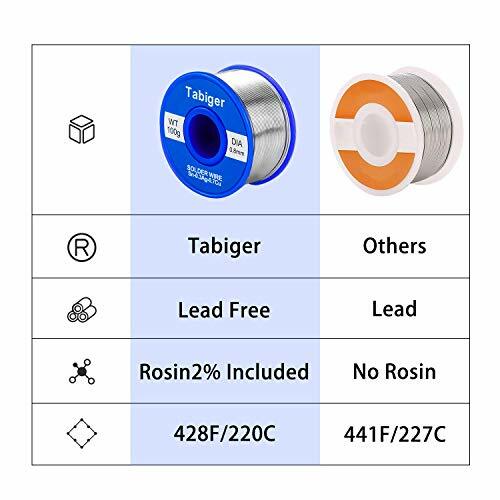 Tabiger solder wire is consist of Sn 97%, Rosin2%, Ag0.3%, Cu 0.7%, it is lead free, good for your health as well as the environment. ?Rosin Core Solder ? Our solder contains 2% rosin, it is good for soldering, so no flux is needed, which can save you from messing up. 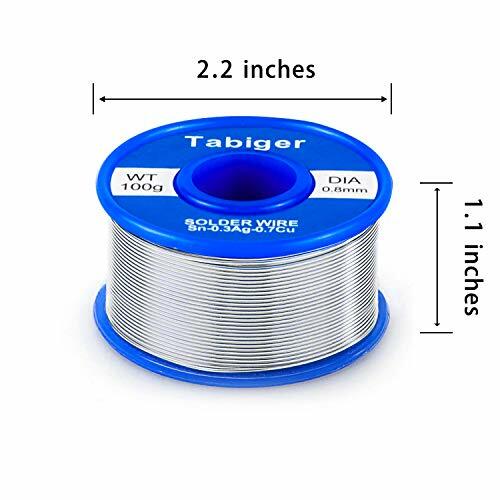 ?0.8 mm Solder Wire? The diameter of the electrical soldering wire is 0.8 mm/ 0.031 inch, It weighs 100 g/ 0.22 lb, the total length is about 57m, which can be used for a long time. ?Good Peformance? 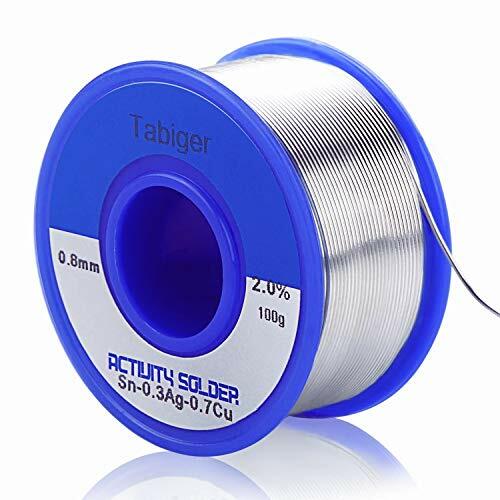 The melting point of this electric solder wire is 215 - 220 degrees Celsius/ 419 - 428 degrees Fahrenheit°, it means that Tabiger solder wires can be used for the majority of soldering iron. ?Widely used? 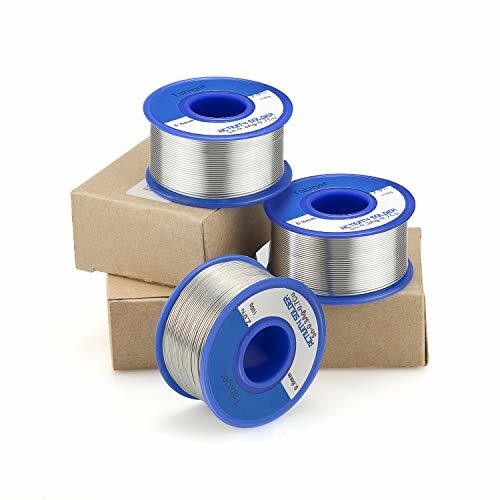 This solder wire is perfect for the electric soldering and wire connections, it can be used for headphone, electric guitar, XLR microphone, laptop, pc boards and so on.